Residential property prices in China’s first-tier cities – Beijing, Shanghai, Guangzhou, and Shenzhen – are back up. Residential property prices in China’s first-tier cities – Beijing, Shanghai, Guangzhou, and Shenzhen – are back up. A home there now runs buyers half as much as a home in the world’s most expensive cities: New York City, London, and Hong Kong. Letting some of the air out of this housing bubble, before too much pressure builds up, will require improved management of China’s rapid urbanization – and not just in the four first-tier cities. Of course, the housing situation is most urgent in the first-tier cities. And their governments have moved quickly to cool the market. Beijing, for example, raised the required down payment for residents purchasing a second flat for investment to as much as 80% of the price, and barred non-residents from such investments altogether. As it stands, urbanization pressure is being felt by the top 100 (out of 600) Chinese cities, which housed 714.3 million residents – 52.8% of the total population – and generated 75.7% of China’s GDP in 2016. Of those 100 cities, six recorded GDP growth above 10% last year, compared to the national average of 6.7%; 82 recorded GDP growth between 6.7% and 10%; and just 12 grew by 6.7% or less. Perhaps more significant, per capita GDP in 33 Chinese cities is higher than $12,475, meaning that, by World Bank standards, they have attained high-income status. 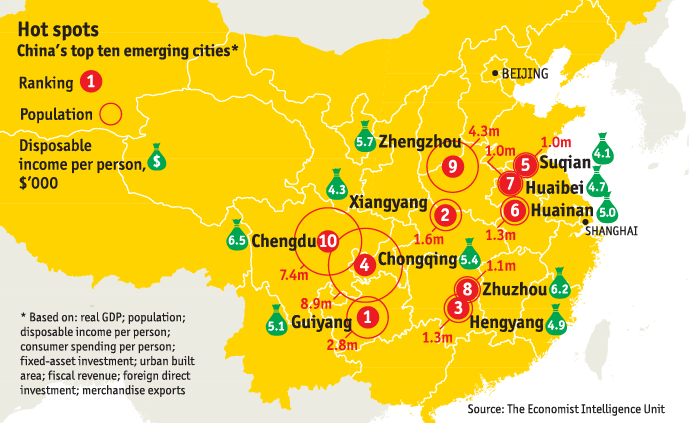 Four years ago, only 16 Chinese cities had crossed that threshold. Urbanization in these high-income cities may provide more valuable insight into how to continue China’s remarkable development story than the experiences of the first-tier cities. A new book, China’s Evolving Growth Model: The Story of Foshan (coauthored by one of us), offers a case study of one of those cities. In recent years, Foshan has transformed itself from a rural county outside Guangzhou, the capital of Guangdong province, into the most dynamic industrial city in China, with per capita income reaching $17,202 in 2016, compared to $16,624 for Beijing and $16,251 for Shanghai. In 2015, Foshan’s GDP grew by 8.3%, compared to 6.7% in Beijing and 6.8% in Shanghai, with industry accounting for 60% of the city’s GDP. Moreover, in a country where excessive debt is a growing concern, Foshan’s loan-to-GDP ratio in 2011 was only 85% – far less than the national average of 121%. Foshan’s rapid GDP growth – among the fastest in China – was driven by the private sector, with appropriate local-government support, and therefore depended largely on self-financing, not debt. Likewise, the private sector has financed about two-thirds of Foshan’s fixed investment, which runs up to 30-40% of GDP. Foshan’s development strategy focused on embedding the city within the supply chains of the dynamic Pearl River Delta – which includes the global cities of Hong Kong, Shenzhen, and Guangzhou – thereby securing linkages to the entire world. It also included the development of skills and capacity in specialized sectors, creating the world’s largest lighting and furniture markets in the world. Foshan now boasts numerous private firms and small- and medium-size enterprises spread across the city’s more than 30 specialized industrial clusters and integrated into global supply chains. Midea Global, for example, is a global leader in the development, manufacture, and sale of household appliances. The city also created linkages with others nearby, with each complementing the others’ comparative advantages, thereby reinforcing collective progress. At the same time, however, Foshan fostered intense competition internally and with other cities in China, which may well be the biggest reason for its success. Foshan’s municipal government, which was among the first to experiment with township and village enterprises and privatization in the early 1980s, has played an important role in buoying private enterprise. In particular, it has supported skills upgrading and built critical infrastructure, while avoiding creating unaffordable housing or unnecessary office buildings. In a country plagued by excess capacity and housing bubbles, this was a prescient policy. The key to success has been the authorities’ flexible approach, guided by close monitoring of market signals. Thanks to such monitoring, Foshan’s municipal- and county-level governments recognized a dramatic restructuring in global supply chains and responded accordingly, such as by improving housing and health care, providing such social services even to migrant labor, and addressing excessive pollution. The local government has also driven Foshan’s private enterprises largely to complete a difficult process of restructuring since 2008. Foshan’s ceramic industry, for example, has transformed itself from a dirty, energy-intensive, and fragmented industry into a clean, energy-efficient, and consolidated sector, largely owing to high standards designed and enforced by the municipal government. Meanwhile, local governments in Northeast China continue to struggle with the supply-side structural reforms needed to tackle overcapacity, excessive leverage, high transaction costs, and gaps in technology upgrading. There is increasing awareness in China of the potential of cities. As Foshan has proved, cities have a unique capacity to support growth – including by fostering competition, advancing innovation, and phasing out obsolete industries – while addressing social challenges, tackling pollution, and creating a labor force that can cope with technological disruption. As China attempts to manage urbanization – responding to, rather than attempting to overpower, market forces – the Foshan model may well prove invaluable.